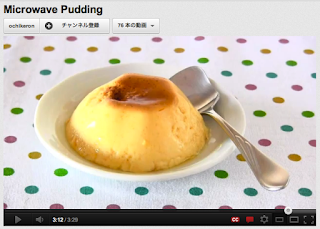 This video will show you how to make a Japanese Custard Pudding in a microwave! The recipe is very easy but please read my instructions carefully since the cooking time differs depending on the wattage and the microwave manufacturer. I really recommend you to use 500w microwave for this recipe because it becomes really spongy if you use higher wattage. 2. Quickly mix hot water, spoon it into center of each microwavable glass dish, and set aside. 1. Combine egg and sugar, add milk and vanilla extract, and beat well. 2. Strain and pour on top of the caramel. 3. Put the pudding cups in a microwavable container with water. Make sure water is filled up to the level of the pudding and does not spill over into the pudding. Then cover the whole thing with a plastic wrap. 4. Microwave at 500w for 5-7 minutes, until it begins to bubble. My cooking time was 7 minutes but please watch out after 5 minutes since the cooking time depends of the microwave even the wattage is the same. 5. Leave to stand for about 5 minutes. Then serve warm or put in the fridge to serve cold.